This summer’s fire in Saskatchewan forced more than 6,000 people from their homes, killed livestock, destroyed buildings and pushed smoke across the country as far east as Ottawa. This was not a metaphorical social media firestorm, but a literal one. What does this type of disaster look like from a communications standpoint? According to Darby Semeniuk, manager of communication services with Saskatchewan’s Ministry of Environment, communication efforts required daily press conference calls and the construction of a new section on the government’s website dedicated to the issue. Allow everyone to play their part. Interdepartmental cooperation helped the Government of Saskatchewan keep people safe and informed. Semeniuk’s department is responsible for the prevention, detection, monitoring and suppression of wildfires in the province. He worked with managers from Government Relations, Social Services, Health and Highways departments to manage communicatiosn and media relations, each responsible for disseminating the message for his or her department. That coordination made it possible to quickly inform residents about road closures and evacuation notices. The team reached out to mayors, city officials and First Nations leaders who, in turn, informed local residents using social media, phone calls and even home visits. In fact, due to the severity of the fires, the government even issued a release in late June asking potential tourists to stay home until the fires are cleared. The government used both digital and verbal communication to inform reporters and the public. To begin with, used a section of the the province’s website dedicated to the fires where each governmental department would load reports as they became available. 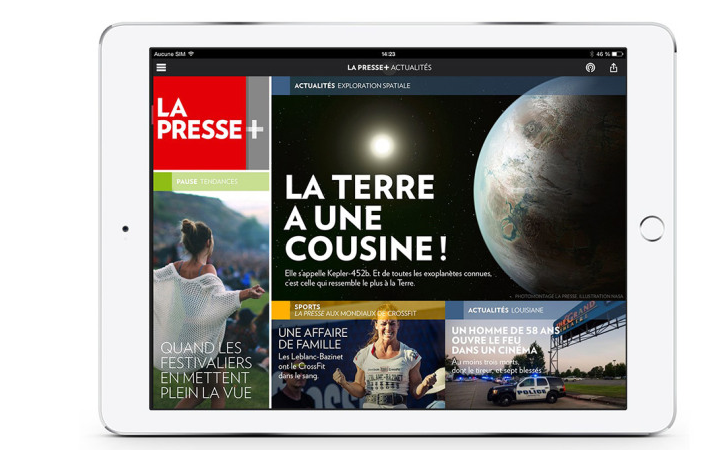 “The site acted as a primary source of information for media and evacuated communities and grew exponentially in its number of visits during July,” said Semeniuk. Semenuik’s team also used a daily conference call with the media to allow department managers to communicate the day’s important messages at once instead of scheduling multiple interviews. Even with this tactic, Semeniuk’s team responded to more than 130 independent media requests in July. Nonetheless, Semenuik noted that the conference calls reduced the number of individual interview requests and helped ensure consistency in the information released. The government also released a daily update on social media, including videos recorded by fire crews to give residents a first-hand look at firefighting efforts. Our social monitoring of the hashtag #SKFire and the phrase “Saskatchewan fires” recorded more than 35,000 social mentions on Twitter on July 15. Communicate with the public first. During a disaster where families and homes are affected, privacy of those affected should not forgotten. To be sensitive to the local residents’ state, Semenuik’s team used general locations rather than specific home or company names when discussing the damage. “These situations can hit close to home for our wildfire teams,” said Semeniuk. “They would often find themselves protecting their own homes and families. The aftermath of a disaster requires as much communications as the disaster itself. 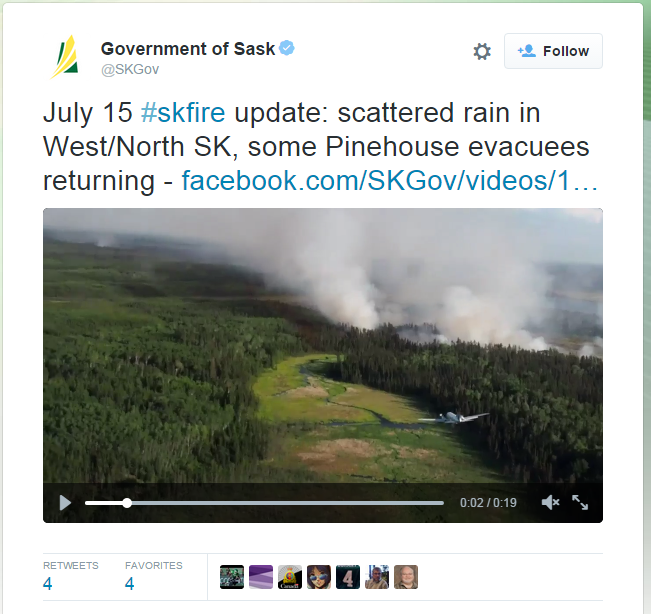 When the Government of Saskatchewan issued evacuation orders for close to 8,000 people on July 4, it issued a press release and a series of Tweets. The communications’ team did the same on July 22 announcing that residents could return home. Two months after lifting the evacuation orders, communications to residents and media continue, but instead of reporting on homes destroyed, the government is announcing investments in recovery efforts.